Immersion, a company that develops and licenses haptic touch feedback technology, today filed a lawsuit against Apple and AT&T accusing the two companies of patent infringement. Citing technologies like 3D Touch, Force Touch, the Apple Watch Taptic Engine, and vibration patterns for ringtones and notifications, Immersion says multiple Apple devices use its intellectual property. - U.S. Patent No. 8,619,051: "Haptic Feedback System with Stored Effects"
- U.S. Patent No. 8,773,356: "Method and Apparatus for Providing Tactile Sensations"
The iPhone 6s and iPhone 6s Plus are further accused of infringing on an additional patent, U.S. Patent No. 8,659,571, titled "Interactivity Model for Shared Feedback on Mobile Devices." "Immersion and its employees have worked diligently for over 20 years to invent solutions and build an ecosystem of content and playback devices that enable realistic and rich digital experiences. Touch matters, as it informs, excites and humanizes the digital world we interact with every day. Many of our licensed customers are market leaders that benefit from our innovation in touch technology," said Immersion's CEO Victor Viegas. "While we are pleased to see others in the industry recognize the value of haptics and adopt it in their products, it is important for us to protect our business against infringement of our intellectual property in order to preserve the ecosystem we have built and the investments that we have made in continuing to advance haptic experiences," added Viegas. "We will vigorously defend the intellectual property we have developed when it is infringed." While Apple is named in the lawsuit because it produces the devices that allegedly infringe on Immersion patents, it is less clear while AT&T is named. In the filing, Immersion claims AT&T sells Apple products and offers guides, directions, and other materials that "encourage and facilitate infringing use by others," but other mobile carriers are not mentioned or included in the lawsuit. 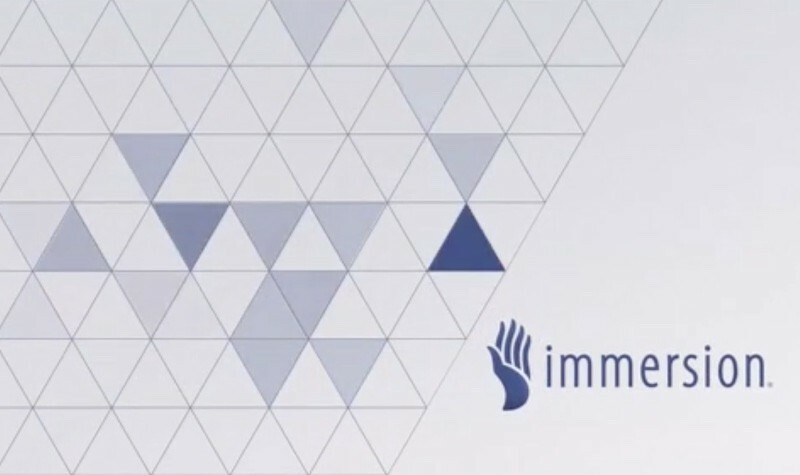 Along with the patent infringement suit, Immersion has also filed a complaint with the U.S. International Trade Commission, seeking an exclusion order that prevents the sale of the accused Apple devices in the United States. Is a lawsuit against Google coming next? Because Android employs haptic feedback also. The Android manufacturers are Immersion licensees. HI GUYS! I Just made some fresh popcorn, Anyone want some? Let me guess, the suit was filed in East Texas? Lol...are they saying they created haptic feedback and own all rights to it? Well they basically put it on the map. I had a Logitech mouse that used Immersion haptic feedback around Win XP time. No one else was doing anything with haptic feedback then. Their patents are probably legit AND they aren't a patent troll company so I'll give this a least a shot before I'll blast them for patent abuse. They certainly do seem to protect their inventions and patents as already said, they took Sony to court for one. If you want to use their tech, license it. You'll remember Immersion from such lawsuits as Sony and the PS3 and this company being the reason why the first couple years the PS3 lacked rumble tech in their controller. This is stupid. Vibration patterns? Really? So this company thinks they can patent haptic feedback, which almost every Android device currently implements. Again, stupid. Immersion is for real. All the Android manufacturers have licensed from IMMR and you can get IMMR's haptic SDKs to develop for Android. Heh. Why not? Seems to be a popular thing to do. Heck, Apple tried to trademark "Multitouch" for themselves, even though it's an industry standard term. Fortunately, Jeff Han (of TED demo fame) talked the USPTO out of granting it at the last moment. But not everything is watched that closely. * Allowing one program to interrupt another already playing a haptic. * Figuring out the correct haptic to play by checking what kind of "object" on the screen was touched. * Preventing haptics from getting out of sync with the user's touch. Ironically, those look like many patents that Apple itself has sued others over: simple methods which are made to look novel by including lots of extra words and variations.